After Buttler top-scored for England for the fourth time in five innings, with 89 on his 28th birthday, James Anderson and Ben Stokes both took two late wickets to leave India 174-6 in reply to 332 all out. Anderson channelled his aggression after failing to win an early lbw decision against Virat Kohli, taking his two wickets in successive overs. Stokes then repeated the dose with the old ball, including the prize wicket of the prolific Kohli one short of a sixth Test 50 of the summer. 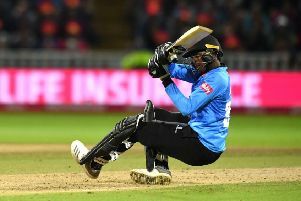 Anderson put himself in danger of disciplinary action from match referee Andy Pycroft after appearing to make his disappointment clear with umpire Kumar Dharmasena when he gave Kohli not out lbw on 16. The decision was reviewed by England, but then rewarded only by marginal vindication for the official via umpire’s call on impact outside off-stump. As for the conversations which followed - briefly between Anderson and Dharmasena, then more protracted when the umpire spoke to captain Joe Root- Buttler was unable to provide further detail. “I didn’t look at it, probably a couple of words, and that’s about it,” Buttler said. It fell instead to Stokes to account for Kohli, and Buttler added: “It’s obviously a massive wicket. He’s one of the best players in the world, and he’s had an outstanding series. Anderson, curiously, has yet to dismiss Kohli this summer - unlike all his fellow frontline England bowlers - but it is always theatre when the two square up. “It’s fantastic Test cricket,” said Buttler. “Virat’s one of the best players in the world, if not the best at the minute, and Jimmy’s England’s greatest ever bowler. As a match-up for fans and players alike, it’s awesome to watch. The two of them are immensely competitive and have a great duel all through the series. I think Jimmy has been particularly unlucky. Buttler also reflected on his own innings, which underpinned England’s recovery from 181 for seven in stands with Adil Rashid and Stuart Broad. “We probably spoke about 50 (more) runs (this morning) - that’s what we were targeting,” he added. “But I thought we worked really well in partnerships, and Rashid’s got a lot of talent with the bat - and we know Broady’s scored some vital runs for England over his career as well. Jasprit Bumrah was one of the India bowlers who were confounded.